This whole project got started by two books I read recently. “The Limit”, by Michael Cannell, and “The Art of Racing in the Rain”, by Garth Stein. Neither of the books have much to do with any of the automotive subjects I have painted out on the iPad yet, but they are coming with illustrations of both Phil Hill and Wolfgang von Trips in the works. 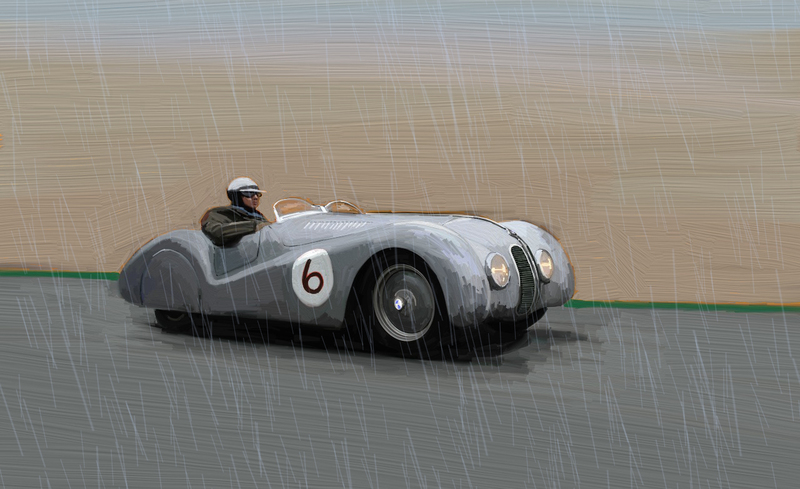 The image below is a 1940 BMW 328 running in the rain. I think this is one of the sexiest looking cars of the period. Great lines, loads of power with its 2-litre six-cylinder engine. Posted in Automobiles, Design and Art, Postaday 2011 and tagged Artrage, BMW 328, iPad, postaday 2011, postaday2011 on December 8, 2011 by Author.